CCRT is located at Bruyères-le-Châtel (Essonne) under the responsibility of CEA DAM-Île de France and is one of the rare computing centres in France open to industrial firms. Its role is to support industrial innovation and promote industry-research partnerships in the field of high performance numerical simulation and data processing. The computing resources at CCRT benefit from the exceptional infrastructures of CEA’s Very Large Computing Centre (TGCC) offering its partners an extensive and secure working tool. The heart of this system is AIRAIN supercomputer, a cluster designed and installed by Bull in 2012. With a computing power of 420 teraflops* distributed over 20,000 cores, it is designed to meet the growing needs of the partners, through a scalable architecture. It has a local data storage system with a useful capacity of 2.3 Pb. CCRT also has access to TGCC’s shared storage infrastructure for longer-term hosting of data. This infrastructure uses an automatic, user-transparent system for data migration to different types of media, thus offering “Big Data” class total capacity. Post-processing and remote visualization resources complete the range of services offered to the users. CCRT is accessed by secure links via the national network for technology, teaching and research (Renater). * 1 teraflop: 1,000 billion operations per second. On the back of their experience gained in the simulation programme, the teams from the Simulation and Information Sciences Division and those from CEA DAM-Île de France engineering Department place their know-how at the disposal of CCRT. From energy optimisation of the computing centre, to the development of Open source components (Slurm, Lustre, etc. ), to the implementation of an efficient, secure data production and management environment, all the skills required for design and operation of very large computing infrastructures are brought together in one place. 9504 Intel Xeon® E5-2680 cores running at 2.7 GHz (16 cores/node - 64 GB of memory/node). 7200 Intel Ivy Bridge cores running at 2.8 GHz (20 cores/node - 64 GB of memory/node). 3200 processing cores dedicated to France Génomique (16 cores/node - 128 GB of memory/node). 18 hybrid B515 nodes (equipped with Nvidia K20). Software environment: Linux, Slurm, Bullx MPI, Intel Cluster studio. CCRT partners have access to the computing power they need for their simulations and can call on the expertise of the CEA teams in all scientific disciplines related to numerical simulation. From research to industry, the numerical simulations performed at the CCRT concern a wide variety of fields; aeronautics, development of airplane and helicopter engines, design and safety of nuclear reactors, prevention of environmental risks, materials sciences, genomics, medical image processing, cosmetology, signal processing, etc. CCRT operates round the clock, except for scheduled maintenance periods. On-site support for the contractors, expert administration teams and an on-call duty system optimises the availability of the computing service. Guaranteeing access security and data confidentiality is a major preoccupation at CCRT. A CEA IT security experts unit controls a security supervision system which monitors, detects and analyses security alerts, enabling the security managers to react extremely rapidly. A one-stop contact point for the users: hotline.tgcc@cea.fr – tel. : +33 1 77 57 42 42. This call centre provides information about CCRT access and utilisation and handles all incidents. Application support: a team of specialists provides its expertise for porting and optimising user codes to CCRT’s machines. 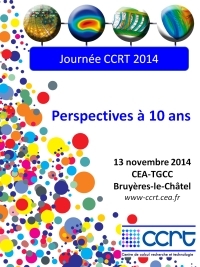 CCRT organizes a yearly seminar devoted to user presentations of their scientific results. Technological workshops are also proposed on topical themes (GPU or manycore type accelerators, new programming algorithms, data processing and visualization tools, optimization of energy consumption, etc.) driven by the partners’ demand.